With no debuts, and no holiday gifting to lure buyers to the digital and/or physical album bins, country sales slid this week. Overall country sales deflated 8% compared with last week, and Top 75 current country folded 24.6% during the same period. Justin Moore’s Outlaws Like Me rings registers at No. 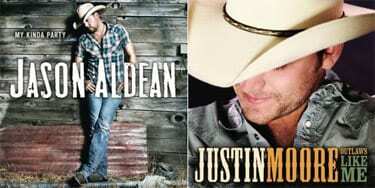 2 on the Country album list with close to 22k unit scans down 28% in its third week of sales. Originally from Poyen, Arkansas, Moore’s “If Heaven Wasn’t So Far Away” also appears on the digital tracks chart at No. 19 with 23k downloads. One step further down the country album list at No. 3 is Mr. Brad Paisley with slightly under 20k scans. Paisley has RTD sales of 345k units spread over 7 weeks. The guitar slammin’, singer/songwriter also has two songs on the tracks list this week, his monster Carrie Underwood duet, “Remind Me,” which logs 68k downloads for a five week RTD of 327k scanned. His other charting track is “Old Alabama,” listing at No. 25. Backing the radar image out to 30,000 ft. we see the album biz overall is up 1% YTD. Country music continues to swim upstream, improving its numbers over each of the past few weeks. Presently, Nashville’s most high visibility product lags only slightly behind the business overall with its album sales down .8% YTD.